Sitter: Rt. Hon. Arnold Morley (1849-1916). Costume: "...a black suit wrought with steel, and trimmed with sable." (Lady's Pictorial, 10 July 1897, p 70c). Orders, Decorations & Medals: Replica of the French Order of the Saint Esprit. Furniture & Props: Backdrop, painted to suggest the garden statuary at Devonshire House; studio balustrade; studio Persian rug. Biog: Who's Who; The Times, 19 January 1916, p 4b. 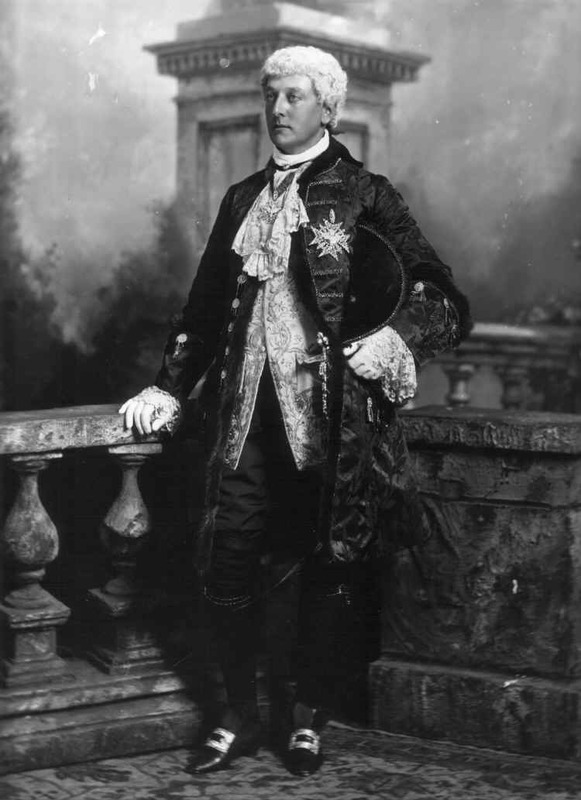 Role: (Duc de Choiseul) Devonshire House Fancy Dress Ball, July 2 1897: A Collection of Portraits in Costume of Some of the Guests, privately printed, 1899, p 93 (National Portrait Gallery Archives); (Courtier of Louis XV period) The Morning Post, 3 July 1897, p 70c; The Sketch, 14 July 1897, p 488. Costume: Lady's Pictorial, 10 July 1897, p 70e. Photography: The Daily Telegraph, 3 July 1897, p 9f; Black & White, 10 July 1897, p 38b. Reproduced: Devonshire House Fancy Dress Ball, July 2 1897: A Collection of Portraits in Costume of Some of the Guests, privately printed, 1899, p 93, (National Portrait Gallery Archives); (Version with Lady Sarah Wilson as Madame de Pompadour) The Sketch, 14 July 1897, p 488.